Thirty Eight from Connecticut attended the Northeast Lecturer's Conference, Aug. 3-8, at the Bridgewater College, the oldest and fourth-largest college in Massachusetts. I thank the staff at the college for a wonderful stay. They were very friendly and helpful to everyone. 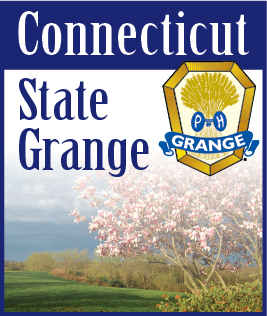 The conference is for grange program directors and members from Maine, Massachusetts, Vermont, New Hampshire, Rhode Island, Connecticut and New York. Rhode Island hosted the event, which had a theme of Let's Celebrate. Each state had a different holiday to celebrate, and each and every program was colorful, educational and lots of fun. There were workshop sessions of brainstorming on how to keep members of an organization informed and entertained, and have fun at the same time. In the talent portion, young instrumental musicians, dancers and singers from each of the states showed their talent. I'm glad I didn't have to judge. They were all good. The Bridgewater College campus was very clean, well kept and secure. Marge Bernhardt, the state lecturer from Cheshire Grange in Connecticut, did a great job putting a fun and colorful program together about Halloween with all 38 members from all over Connecticut participating. There were songs, skits, jokes and treats for everyone attending. Two Connecticut men tried to made an apple pie, thinking it was easy; however, they gave up after making a mess and bought one instead.